British loudspeaker manufacturers PMC have been building world-class monitor systems since 1990, exclusively using a development of the transmission-line cabinet principle that the company call 'Advanced Transmission Line' (ATL). The company's professional client list is a veritable Who's Who of the recording industry, including most of the top mastering and recording studios, radio and TV broadcasting companies and film dubbing stages, as well as numerous famous engineers, producers and artists — so they must be doing something right! Surprisingly, perhaps, the majority of PMC's monitors have been passive designs, employing 'high-level' crossovers to distribute the signals from one or more power amplifiers to their respective drivers. However, with the improving quality of Class-D amplifier designs and the benefits of sophisticated DSP processing and control, PMC started exploring the possibility of making compact active monitors that matched or exceeded the quality of their previous passive designs. 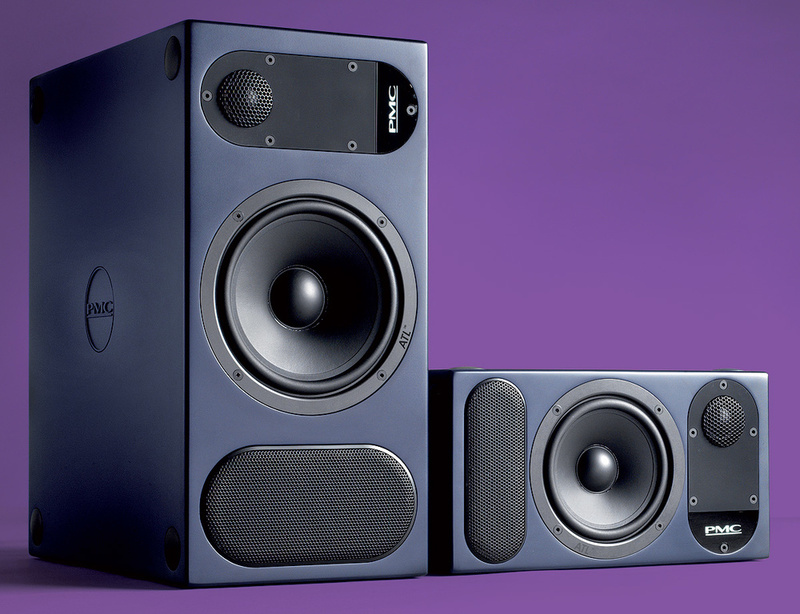 The first foray into this new territory was with the RM1 and RM2 active DSP monitors, which they designed and built for Digidesign (reviewed in SOS October 2007). That project was very successful, and the approach was developed further to produce PMC's second-generation, three-way IB2SA mid-field monitor. Six years on, and all of that design experience, combined with further R&D work, has resulted in a brand-new monitor range called the TwoTwo, comprising three two-way nearfield models, with a dedicated subwoofer and remote controller coming soon. The two monitors reviewed here are the smallest models: the TwoTwo 5 has a 5.5-inch bass/mid driver, while the TwoTwo 6 has a 6.5-inch bass/mid driver. The largest model, the TwoTwo 8, boasts an eight-inch bass unit. The entire TwoTwo range is redesigned from the ground-up, employing brand-new bespoke new drive units, Class-D amplifiers, DSP crossovers, cabinets, and ATL profiles — and they are all built in the UK. Interestingly, while the compact TB2 and DB1 monitors (which were designed in the mid and late 1990s, respectively) vent at the rear, PMC have taken the opportunity to move the ATL vent back to the front baffle for the TwoTwo, as it is on all of their earlier monitors. 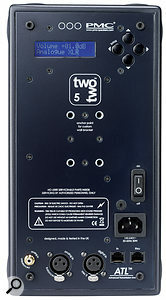 A unique aspect of the TwoTwo design is that these monitors can be used either horizontally or vertically without compromising the tonal or stereo-imaging performance. This makes them ideally suited for near-field monitoring in situations where space (or the need to maintain a low profile) is at a premium — such as in project music studios, on console meter bridges, in small radio on-air studios and outside broadcast vehicles, or under TV screens (including as centre-channel speakers). Built-in sorbothane isolation pads (mischievously referred to as 'Deecups') on all four surfaces ensure secure, stable and vibration-free placement in either orientation. However, achieving this flexibility requires the frequency response in both the vertical and horizontal orientations to be perfect, with wide horizontal and vertical dispersion, consistent off-axis response, and stable stereo imaging. This is where the precise control afforded by the DSP-based crossover comes to the fore, allowing minute but critical adjustments to the crossover slopes and phasing/delay, to ensure that the driver outputs sum correctly throughout the crossover region. Of course, the offset tweeter means that the speakers come in right and left versions, and PMC recommend placing the tweeters on the inside of the listening triangle, aimed such that their axes cross about 20 inches (0.5 metres) behind the listening position. The rear panels host both digital and analogue inputs, as well as a menu-driven control system and RJ45 sockets for speaker linking and connection to a remote control. 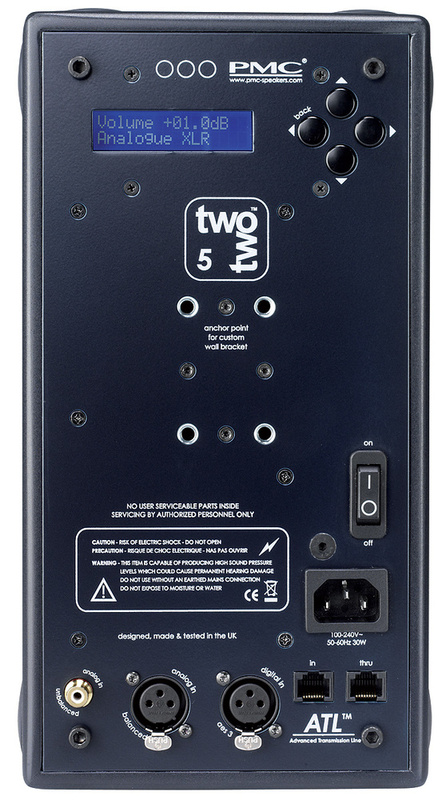 The pocket-sized TwoTwo 5 cabinet measures 296 x 155 x 295mm (HxWxD) and weighs in at 5.4kg. Its bigger sibling is a little heavier at 8.4kg and its cabinet measures 406 x 194 x 364mm (HxWxD). Thankfully, PMC have finally moved away from boring black-painted cabinets for their professional models: the TwoTwo range is finished in a subtle dark blue, which looks very sophisticated and upmarket in the flesh — even if it doesn't always seem to come across very well in photographs. All three TwoTwo models feature the same 27mm soft-dome tweeter, and the same basic design of bespoke, doped-paper bass-mid drivers, albeit in different sizes. The different cabinets also impose different ATL lengths, 1.5m for the TwoTwo 5 and 1.6m for the TwoTwo 6, with a corresponding difference in bass extension of about 10Hz. The TwoTwo 6 has a published frequency response of 40Hz to 25kHz (no tolerance limits given), while the TwoTwo 5 is specified as 50Hz to 25kHz. Power handling is also slightly greater for the larger model, as you might expect, with a maximum SPL of 113dB at one metre, versus 111dB for the TwoTwo 5. All the connectors and controls are located on the rear panel, and the monitors are equipped with both analogue (balanced and unbalanced) and AES3 digital inputs. The AES3 input accepts sample rates up to 192kHz, using a Burr-Brown SRC chip to resample the signal for the fixed 96kHz Texas Instruments DSP engine. The latter provides the overall system volume control, crossover filters, basic room-EQ facilities, and driver optimisation and protection functions (based on modelled driver-excursion limiting, rather than signal limiting). This signal processing generates the tweeter and bass/mid output signals, which are converted to analogue again via a Wolfram 24-bit D-A converter. Three discrete, Class-D power amplifiers are employed: one provides 50W for the tweeter, while the other two are arranged in a bridged mode to deliver 150W to the bass/mid driver. PMC claim that these amplifiers provide the lowest THD, IMD and output impedance in their class. The TwoTwo speakers have RJ45 sockets on the rear panel, to allow for speaker-linking and remote control options. Essentially, the first speaker in the chain becomes the master controller (with the optional remote controller, if present, plugged into its 'In' port), and its Thru connector is used to pass control data (and, if required, the second channel of an AES3 digital audio input) onto the next speaker, via a standard Ethernet cable. The TwoTwo monitors are configured via a simple menu system accessed through a set of navigation buttons and a backlit LCD on the rear panel (or from the remote controller). Factory default settings can be recalled by simultaneously pressing the up and down menu buttons for more than two seconds, and scrolling through and adjusting the menu options is very simple and logical. The menu tree starts with the overall volume setting, which can be adjusted between -48.5dB and +15dB. The input source can be selected from the balanced (XLR) or unbalanced (RCA-phono) analogue inputs, or the left or right channels of the AES3 digital input. The analogue input sensitivity can also be set between +4 and +20 dBu, and the gain fine-tuned with a digitally controlled attenuator over a ±8dB trim range, to optimise the level feeding the Burr-Brown delta-sigma A-D converter. The latter produces a 24-bit/96kHz output, which it sends to the DSP engine. If required, the monitor's frequency response can be tweaked with digital EQ, offering adjustable bass and treble shelf sections, and a high-pass filter. The shelf equalisers have sensibly restricted ranges (±4dB), with the LF turnover starting at 750Hz in the TwoTwo 5 and at 500Hz in the TwoTwo 6. Both models have the same treble shelf (from 1kHz) and 6dB/octave LF roll-off options, with options for 200, 150, 120, 80 or 50 Hz (and bypass). These facilities should allow a nominally flat response to be achieved regardless of placement and boundary proximity. Regular SOS readers will know that I have a certain affinity for PMC monitors — my reference monitors are three-way IB1s, and I also often use the DB1 or TB2 SAII when recording on location. For me, one of the main attractions of PMC monitors is the way in which the tonality stays balanced regardless of listening level — a major benefit of the ATL cabinet. Most ported speakers have an impaired bass output at low listening levels, and you need to crank the volume above a certain point before they really come alive. That just isn't the case with PMCs. Given the sizes of the TwoTwo 5 and TwoTwo 6 models, it naturally made sense to compare them directly with the two-way DB1 and TB2 monitors, as well as my normal three-way IB1 benchmark reference. As it happened, I also had access to ATC's SCM25A and Neumann's KH310 three-way monitors during the review period. Most of the listening took place with a Crookwood M1 mastering console serving as the monitoring controller, but I also used a Grace Design M902 and a Bryston SP1.7 in other listening setups. Commercial music sources mainly came from a Sonos system replaying ALAC files ripped from my eclectic CD collection, but I also played a variety of mix projects from my DAWs (SADiE and Reaper) to test how easy or otherwise it was to hear details and processing adjustments within complex mixes. When positioned in free space, well away from walls, I found the TwoTwo monitors tended to sound a little anaemic and bass-light — but with a similar overall tonality to the previous TB2 model in a similar setting. Dialling in a little LF shelf boost easily resolved this, to produce remarkable bass extension and output from such compact boxes — especially in the case of the TwoTwo 5! When the monitors were positioned in a more typical console meter-bridge or desktop configuration, the balance was fine with the EQ controls set flat, and if they were placed up against the back wall, the LF roll-off functions quickly tamed the inherent bass lift. I found the HF balance to be spot-on, but for those who prefer a crisper, more detailed sound, a dB or so of HF lift easily ticks that box. Although the DB1 monitor undoubtedly sacrifices some neutrality for bass extension, the TB2 (especially in the current incarnation) is a pretty honest and revealing monitor for the money. In switching between the TwoTwo 6 and TB2, it became clear to me that both speakers share similar tonality and bass extension, but there was no doubt that the TwoTwo 6 was very obviously revealing mix details and subtleties that were eluding the TB2. To be blunt, the TwoTwo 6 is in a whole different league to PMC's previous compact speakers, and although I wouldn't normally compare two- and three-way monitors — the latter are always capable of greater mid-range transparency and resolution — in this case it seemed like a valid thing to do. Amazingly, both TwoTwo monitors fared very well indeed against the ATC and Neumann models, delivering similar mid-range clarity and transparency to the new KH310. (The ATC's mid-range dome is hard to beat, but then that model is considerably more expensive!) The TwoTwo 5 represents an even greater improvement over the DB1 than the TwoTwo 6 does over the TB2, managing to produce an impressive bass extension without compromising the mid-range accuracy. Both TwoTwo monitors are capable of delivering silly sound pressure levels for a nearfield design, and the DSP excursion-limiting protection circuitry is virtually inaudible. On a few occasions, I managed to get the illuminated logo to flash red without any audible signs of distress! In terms of stereo imaging, both TwoTwo monitors delivered excellent results, with a wide and stable sweet spot, and very good depth and lateral positioning cues. I preferred the imaging with the speakers in portrait mode, but there really wasn't much to pick between the two orientations, which is another impressive feat. Without doubt, the new TwoTwo range is a significant step up in quality for PMC's compact monitor portfolio — and that is reflected in the price. The quality improvement is so great that I'd say the TwoTwos are treading on the petticoats of the flagship AML2! Clearly, PMC's evolution of the DSP technology, combined with the latest generation of Class-D amplification and some highly evolved cabinets, has produced something which is far greater than the sum of its parts. Highly recommended for auditioning. The TwoTwo 6 is priced to compete directly with the likes of the three-way, sealed cabinet Unity Audio Boulder and the four-way Focal SM9, is fractionally more expensive than the Adam S3XH and PSI A21M, and is within reaching distance of the Geithain RL904 — all of which are superb monitors. The smaller TwoTwo 5 finds itself competing with the Neumann three-way sealed-cabinet KH310, the Genelec 8250A, the Ada S3XV, KRK's Expose E88 and Quested's V2108. Seriously impressive neutrality and resolution. Versatile orientation options and built-in isolation mounts. Impressive but well-controlled bass extension for cabinet size. Analogue and digital inputs, plus system linking and remote control options. A big step up in price from the DB1 and TB2. Blue cabinets might not appeal to all. These monitors significantly improve on the old passive, two-way compact models that they supersede, delivering seriously high-end monitor performance. PMC TwoTwo 5 £3300; TwoTwo 6 £4200. Prices are per pair including VAT. PMC TwoTwo 5 $3999, TwoTwo 6 $4999. Prices are per pair.